Organizations today are certainly looking to move at least part of their infrastructure to the cloud. Google’s G Suite and Google Cloud Platform provides businesses a wealth of services and cloud infrastructure that allows scaling IT infrastructure effectively and with agility that organizations simply would not be able to accomplish on their own. However, one of the often cited challenges with organizations moving to the cloud is security as well as integrations and interoperability between platforms and services. Spinbackup is a company that has certainly made waves in the Google G Suite space since 2016 and is continuing to grow its presence in this space and other markets. It provides exciting data loss and data leak protection as well as cybersecurity to Google G Suite environments. Recently, Spinbackup released exciting news of additional security features as well as integration with Google Cloud Platform to offer even more possibilities to its customers and their data. Let’s take a look at Spinbackup announces enhanced G Suite security and Google Cloud Platform integration. Ransomware Protection – Ransomware is an especially scary thing to organizations and their data. The ransomware threat extends into the public cloud as well as cloud in itself does not magically protect data from ransomware. Spinbackup’s ransomware protection module scans for and automatically remediates ransomware processes. It also provides a powerful automatic mechanism to restore data that is corrupted by ransomware. Sensitive Data Control – Businesses today must protect data at all costs. Data leak represents a tremendous threat to organizations as it can mean significant loss and damage to finances as well as reputation. Spinbackup’s Sensitive Data Control allows organizations to control data that is sensitive from leaving the boundaries of the G Suite organization, such as credit card numbers, etc. Insider Threat Detection – Insider threats are often just as dangerous to overall security as threats from the outside. Insider Threat Detection allows organizations to quickly identify user activity or behavior that can represent an unscrupulous employee or compromised credentials. This includes identifying abnormal logins, data downloads, etc. Let’s take a look at each of these enhancements and how each of these enhancements serve to give much greater visibility and control in the G Suite environment to G Suite administrators. G Suite administrator visibility is crucial to effective managing a G Suite environment and making sure there are no hidden security threats and data leak disasters looming. 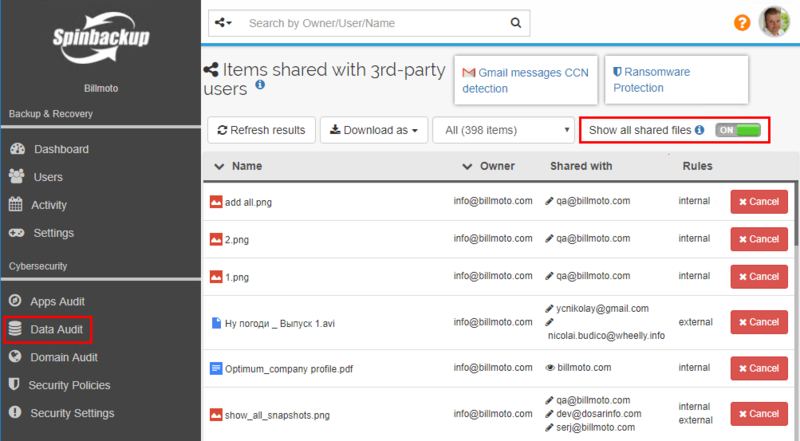 With the Shared Objects Enhancement, Spinbackup allows G Suite administrators even greater visibility to identify resources that are shared both inside and outside the G Suite organization even if the file shares do not fall under the control of a specific Spinbackup policy. G Suite administrators can revoke access directly from the Data Audit dashboard. Spinbackup’s intelligent and robust machine learning algorithms provide extremely accurate identification of threats and other events in the G Suite environment. However, the new Spinbackup Incident Feedback feature allows G Suite administrators to provide feedback on cybersecurity events confirming whether the event was correctly identified and classified correctly by the Spinbackup system. Directly from the Domain Audit dashboard, G Suite administrators can classify events using the new Status column. By clicking the link in the Status column they can classify the event and add notes to the Message field for later review. Notifications can play a key role in security event visibility. Spinbackup’s new Aggregated Security Reports feature allows G Suite administrators to have the ability to receive a security events digest email that daily identifies the noted cybersecurity events in the G Suite environment. The email contains links to the relevant Spinbackup modules so that G Suite administrators can quickly review the information directly from the Spinbackup console. The newest offering from Spinbackup, announced in April 2018, is the ability for customers to store their data in the Google Cloud Storage platform. This newest enhancement allows customers to have advanced availability and security for their organization’s data as well as creates new opportunities for Spinbackup G Suite partners to store and manage customer data in the Google Cloud Platform. What is Google Cloud Platform? Where as G Suite is Googles Software as a Service offering (SaaS), the GCP offering is Google’s Infrastructure as a Service (IaaS) cloud infrastructure platform that allows organizations to build out virtual machines, containers, big data platforms, IoT, Cloud AI, software defined networking, and many other IaaS offerings that allow organizations to build, test, and deploy applications on Google’s highly-scalable and reliable infrastructure. 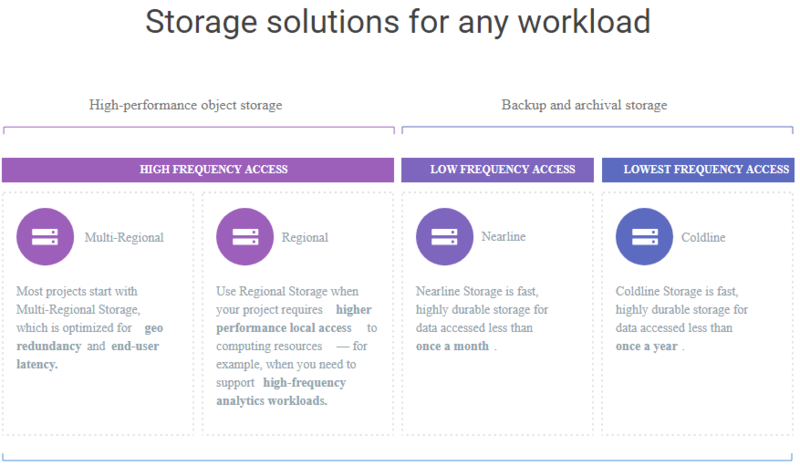 Specifically in relation to storage, Google Cloud Storage provides a unified offering across the availability spectrum. This includes ultra quick storage that allows business-critical applications to have access to data quickly, as well as cloud archival solutions that include nearline and coldline storage. Google’s Cloud Storage platform provides an API driven interface that allows organizations to programatically control and maintain their Google Cloud Storage solution. The new integration between Spinbackup and Google Cloud Platform will no doubt help Spinbackup form new alliances and scale business growth with capabilities that are expanded by the new integration with Google Cloud Platform. Customers will benefit by the new capabilities this will allow from the Spinbackup interface and functionality that will be provided with this new integration that will allow organizations to tailor their G Suite, compliance, and other needs to more closely suit their individual use cases. Spinbackup is a great company, with a tremendously powerful product. You won’t find a better product to help protect your G Suite environment. Organizations who are feeling the challenge of public cloud migration from a data protection, leak, and cybersecurity standpoint. The new features introduced give even more robust tooling and visibility to G Suite administrators and makes the Spinbackup solution even better. The new integration with the Google Cloud Platform makes the Spinbackup solution even more powerful since this will offer customers even more options with integration with the Google ecosystem. Since many organizations are either looking at running or already running infrastructure in the Google Cloud, having the ability to store G Suite data from Spinbackup there makes a lot of sense for those customers. If you haven’t already, check out Spinbackup for a free trial of their state of the art G Suite protection.